A yummy recipe to share. So good, great for gift-giving or just to eat! Stolen from Daydreamer Desserts. Her pics are awesome! I confess that these were the last few pieces remaining from a few batches this year. Line a baking sheet with parchment paper or silicone mat. Place whole pecans in a single layer over baking sheet to cover an area of approx. 8 x 10 inches. Set aside. Combine butter, sugar, and whisky in a heavy saucepan. Cook over high heat stirring constantly until candy reaches 300-310 degrees F (hard crack stage) this step generally takes about 5-7 minutes. Remove from heat and quickly pour over the pecans. Allow toffee to cool completely. Melt chocolate in the microwave oven in intervals of 30 seconds at 50% power and stirring inbetween until chocolate is soft enough to spread. 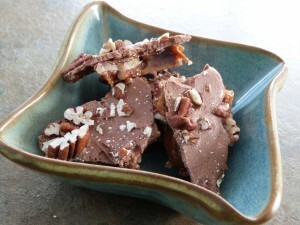 Spread melted chocolate over cooled toffee and sprinkle ½ cup chopped pecans. Allow chocolate to cool completely before breaking toffee into bite-size pieces. Toffee can be chilled in the refrigerator to help speed up the process. © 2012, iLiz. All rights reserved. Responsive Web Design Brantford: WebFire Designs.